When you return to see your prosthetist for the check socket fitting, you should bring a pair of shoes with you. This visit will last about one hour. 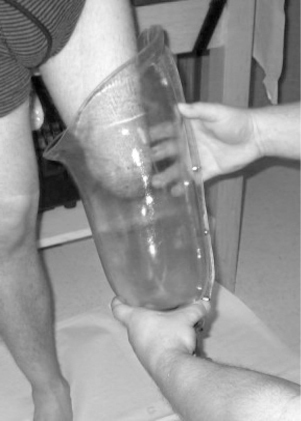 The check socket is typically made of a clear plastic that allows the practitioner to view the pressures exerted on the residual limb prior to fabrication of your temporary prosthesis. During this visit, the prosthetist will allow you to stand in the prosthetic check socket. After adjustments are made to the socket to alleviate pressure points, your prosthetists will ask you to walk in the parallel bars to dynamically align the prosthesis. Your practitioner will work with you to make any necessary adjustments to the socket for a better fit and to optimize how you walk. Following this visit, the practitioner will fabricate the temporary prosthesis. This process normally takes about a week from the check socket fitting. We have eight locations located all around Oregon so you don't have travel far for us to help you! Visit Us Today & Follow Us On Facebook!